OAKLAND, Calif. (KGO) -- If you've been talking about the Golden State Warriors the past few days, you're not alone. As if last year's NBA championship wasn't enough, the Dubs have already secured a spot in this year's playoffs and they're well on their way to breaking the NBA's regular season win record. Ask any one of the teens at Skyline High School in Oakland, and there's a good chance they saw Stephen Curry's buzzer beater that won the game and threw the Dubs star into a victory dance. "Curry made that clutch shot at the end, that was pretty amazing," said one teen. But another added, "They played good but I feel like OKC shoulda won that game." And she's not the only one. "I don't think, there was no way we should've won that game," said Warriors star Draymond Green, who was surrounded by reporters after practice on Monday. Curry says he didn't plan to take that shot. "I didn't know when I got the ball I was gonna take it," he said. "But I knew in five seconds, that a lot can happen. Even Coach Steve Kerr is shaking his head. "It was the game of the year, for sure," he said. The win means the Warriors already have a spot in the playoffs. The team is already warning fans that they've started spotting fake playoff tickets online. And fans? Well, they're already thinking about the finals. "They playing good, we gonna have a repeat!" said one fan. And the players are loving it. "Honestly it's been a great ride, I'm very blessed and very grateful to be a part of this ride," said Warriors guard Shaun Livingston. Now with everyone's attention, Livingston has something to say - he's pledging to stand up to fight bullying. It's something he wishes he'd done sooner. 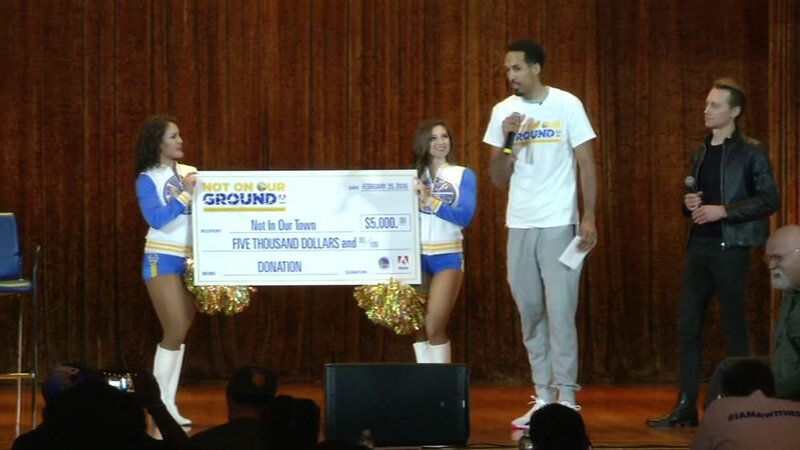 "As a youngster, not standing up for others, and I think that was sending me down the wrong path,"
The Warriors gave $5,000 to the cause. But they're giving more than that. "Having this team that has lit our town on fire stand up with us and be a role model to young people is incredibly powerful," said Not in Our Town Executive Producer Patrice O'Neill. Students made videos and performed poetry. "I can't breathe. The normal heartbeat you expect to hear ain't there no more," said one teen during a performance. The message hit home; especially for those other Warrriors from McClymonds High School. "Yeah, I'm definitely not gonna tolerate bullying if they're not tolerating bullying," said one teen. "Cause we both the Warriors, might as well stand up."